As president of operations at our corporate office, physical therapist Michael Salaway brings 24 years of experience in physical therapy and health care management to his post. He received a Bachelor of Arts in Biology from Monmouth College and a Master of Science in Physical Therapy from Washington University Medical School, St. Louis, MO. He is a member of the American Physical Therapy Association, the Illinois Physical Therapy Association and the Private Practice Section of APTA. When he is not working, he enjoys traveling, golfing, and going to Chicago to attend sporting events. He loves to spend time with his family including wife Celia, a business architect at St. Farm and three children, Nicole in Chicago, Diane in Phoenix and Bret in Bloomington and his three grandchildren (two from Diane and one from Bret). 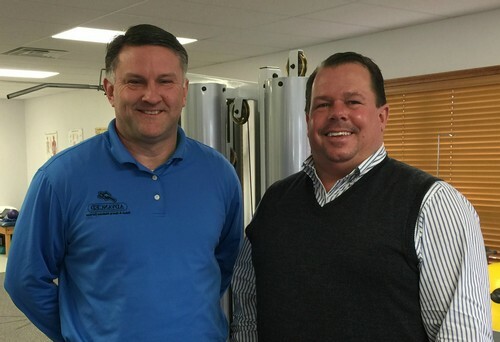 Co-founder and physical therapist Christopher Byers, who currently works out of the corporate office, has a Bachelor of Arts degree in Biopsychology from Monmouth College (1989) and a Bachelor of Science in Physical Therapy from Rosalind Franklin School of Medicine in 1991. He has extensive experience in outpatient, long-term care, sports medicine, home health care and administration. When he is not working, he enjoys hunting and spending time with his family which includes his wife, Cheri and three children, Lindsay, 20, Beau, 18 and Reid, 16. He was drawn to the field of physical therapy after sustaining two knee surgeries when he was in high school and being exposed to how effective the therapy could be.